Simon Bolivar (SSBN-641) was laid down on 17 April 1963 by the Newport News Shipbuilding and Drydock Co., Newport News, Va.; launched on 22 August 1964; sponsored by Mrs. Thomas C. Mann; and commissioned on 29 October 1965, Comdr. Charles H. Griffiths commanding the Blue Crew and Comdr. Charles A. Orem commanding the Gold. In late December 1965 and most of January 1966, the submarine underwent demonstration and shakedown operations. The normal routine for fleet ballistic missile submarines is for the Gold Crew to make a patrol and then alternate with the Blue Crew. The Gold Crew successfully fired an A-3 Polaris missile off the coast of Cape Kennedy on 17 January, and the Blue Crew completed a successful missile firing two weeks later. In February, the Gold Crew continued shakedown operations in the Caribbean. The following month, her homeport was changed to Charleston, S.C., and minor deficiencies were corrected during a yard availability period. Beginning in April, the Blue Crew prepared for and conducted the first and third regular Polaris patrols. The Gold Crew meanwhile entered the training period and later conducted the second patrol, finishing the year in a training status. Simon Bolivar completed her third deterrent patrol in January 1967, operating as a unit of Submarine Squadron (SubRon) 18. This routine continued until 7 February 1971 when the submarine returned to Newport News for overhaul and conversion of her weapons system to Poseidon missiles. Simon Bolivar departed Newport News on 12 May 1972 for post-overhaul shakedown operations and refresher training for the two crews which lasted until 16 September. The end of 1972 found the submarine back on patrol. 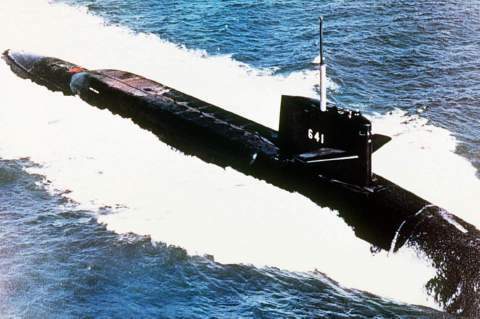 Into August 1974, the Blue and Gold Crews have alternated in keeping the fleet ballistic missile submarine on deterrent patrols, providing the United States with instant retaliatory capabilities in case of attack.